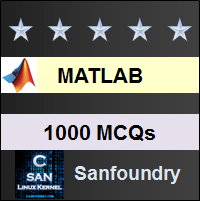 This set of MATLAB Multiple Choice Questions & Answers (MCQs) focuses on “Simulation – 1”. Explanation: There’s an error in the above code. It’s a typical spelling error which is why MATLAB doesn’t recognize the command. A ‘u’ is missing since the actual command is Simulink. 2. What does the following block do? Explanation: The above shown block does the work which converts a simulink signal to a physical signal. This is used to convert a signal from a transfer function toolbox, say, to a physical real signal which can be used for evaluation in circuits. Explanation: It is connected to all separate n/w’s present in the model. It will calculate the parameters of every component present in the circuit, during Simulation, and the model won’t be simulated without this solver. 4. What is the error in the following model? Explanation: The ground in Simulink toolbox is not compatible with circuits while the ground in the HDL Coder Toolbox is. The Simscape toolbox doesn’t have a ground. The HDL Coder ground is missing. 5. 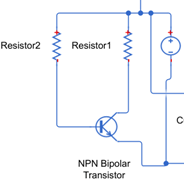 Is this block necessary for circuit analysis in the SIMULINK model? Explanation: This block is essential for analysis using circuits. Without it, the simulation won’t start in the Simulink model. 6. How can we connect the following blocks? Explanation: The signal from the current sensor is treated as a physical sensor to account for the noise, temperature changes in the environment of the circuit. Now, since this is a physical signal- we actually need to convert it to a signal which is compatible with the Simulink environment and this is done by a converter which converts a physical signal to a Simulink signal. Henceforth, we can connect the output of the converter to our scope and watch the output swing. 7. What does this block do? Explanation: This block is used to carry a signal from one part of the circuit to another. To exemplify the concept, we may want to see the graphs for the input and output voltage as a stack in the scope. We can connect the input to the scope via the Goto block instead of connecting the input signal through a wire with the scope. 8. What type of signals does this block take? Explanation: This block has essentially been designed in MATLAB to multiplex any kind of signal. It accepts both real and complex signals so it also takes digital signals. 9. When does the ramp function start in the following block? Explanation: The ramp function can start from any instant of time. This can be specified by the user while setting the parameters of the block. 10. Which waveform is not produced by the above block? Explanation: The cosine waveform can be generated by delaying the sinusoidal signal by pi/2. The Square and Sawtooth waveforms are also generated by this block. The signal to represent tan(x) is not available in this block. 11. Which of the following takes a mathematical user-defined function directly? Explanation: The Fcn block allows a user defined function to operate on signals during simulation and directly give a desired mathematical function. The Interpreted MATLAB function block is used to call the MATLAB commands which are pre-defined in MATLAB. The Function Caller block is used to specify a stateflow chart which can be used as a separate function block. 12. What does this block do? Explanation: The given block checks whether the input given to this block is 0 or not. If it’s 0, the block returns an error. 13. Is the battery voltage dependent on charge? Explanation: We can set the charge content of the battery and thereby make the voltage coming from it as a charge dependent voltage source which is quite nice for real time simulation. 14. Can we simulate transient states in Simulink. Explanation: We can simulate the characteristics of a circuit in MATLAB. This means we can calculate the total response of a system in SIMULINK. 15. Does this block take noise into account? Explanation: This block is treated as an ideal constant voltage source. It can be used in place of the voltage source already present in Simulink toolbox.